The focus on rabbits has stayed with me. 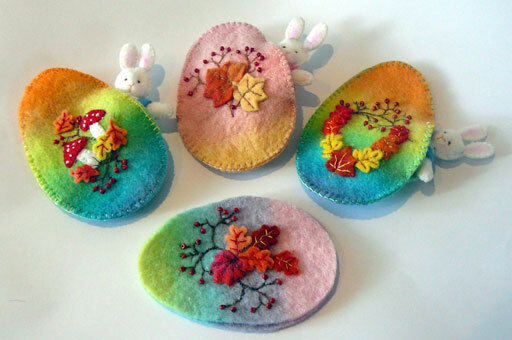 More bunny characters have appeared, as suspected, such as these little rabbits who were placed in Autumn themed eggs in an attempt to connect the season here to the celebration. This is not really a new fascination. I really do, and have since childhood, like rabbits. These much adored and much maligned creatures have an endearing character, an intrinsic gentleness, as well as lovely soft, rounded shapes and such beautiful, “melt your heart” eyes. 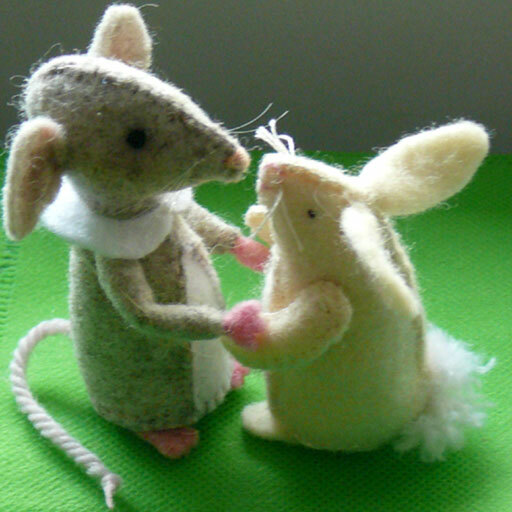 Apart from an early introduction to chocolate bunnies, it had to be a story book from childhood about a little white rabbit called Pookie, who set the world right again after he had sent winter away, that most likely triggered this affection for rabbits. 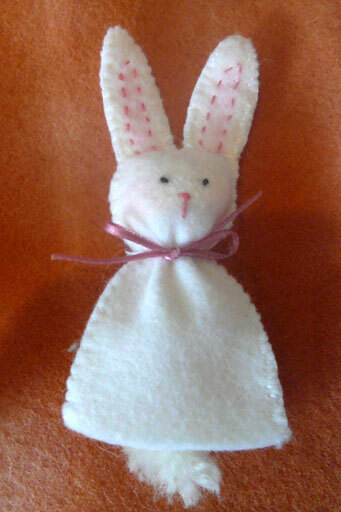 An affection that further deepened when I was seven or eight and given a white rabbit as a pet. That was quite a while ago. In this current state of rabbity adoration I made another from a re-discovered sketch stashed away in the “one of these days ” folder. This bunny needed a friends- and yes, a mouse thing might be happening in the near future. 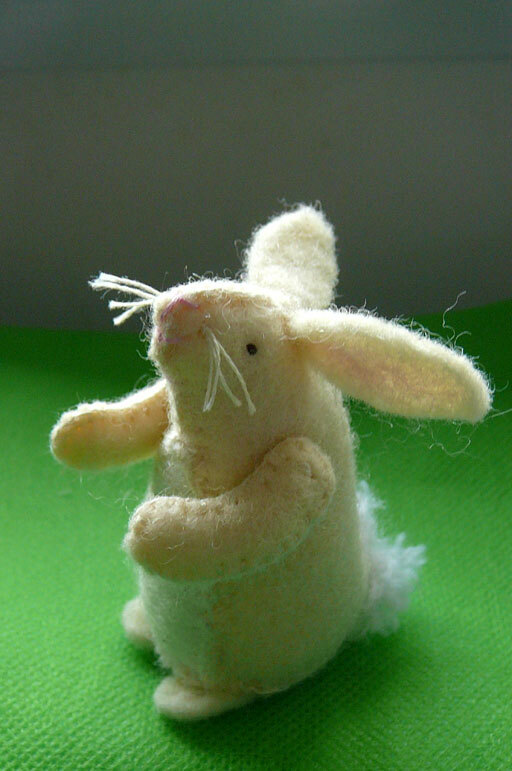 Cute took on a more realistic rendition in needle felt over the weekend in the form of a snow hare made as a companion for a requested Eostre. 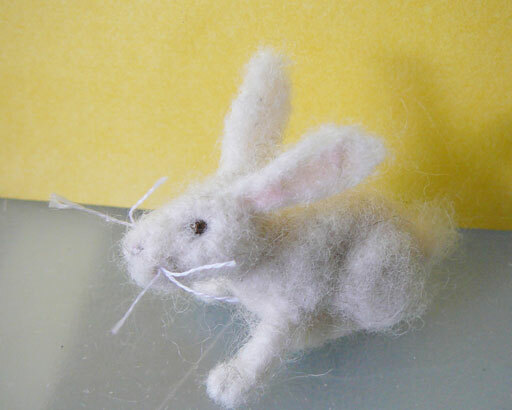 This hare was also a return to dry felting after too long a break. To share is a little egg cosy or puppet which is very child friendly; a project we made recently in a children’s craft class. 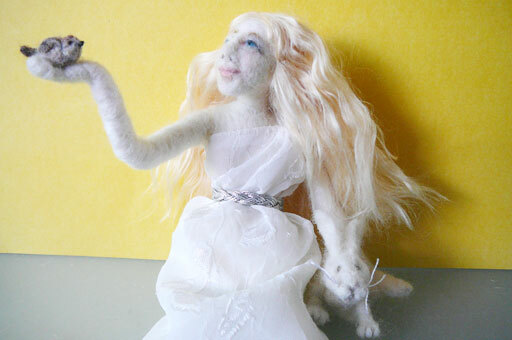 To make first embroider the features. Outline the inner ear with running stitch and tint with crayon or coloured pencil. Next blanket stitch all around to join the back and front. Shape the head with a little stuffing and gather around the neck or tie to hold the stuffing in place. On the back add a tiny pompom tail. You can tie a narrow ribbon around the neck if desired.